The Golden Mount is one of Bangkok’s famous landmarks located in the Wat Saket temple complex. Wat Saket is often referred to as the Temple of the Golden Mount. It is one of Bangkok’s oldest temples surrounded by a quiet neighbourhood in the historic old town of Bangkok. The Golden Mount is actually a man-made hill. Whilst the network of klongs, or canals, was being expanded through Bangkok the excavated soil was used to create the hill. 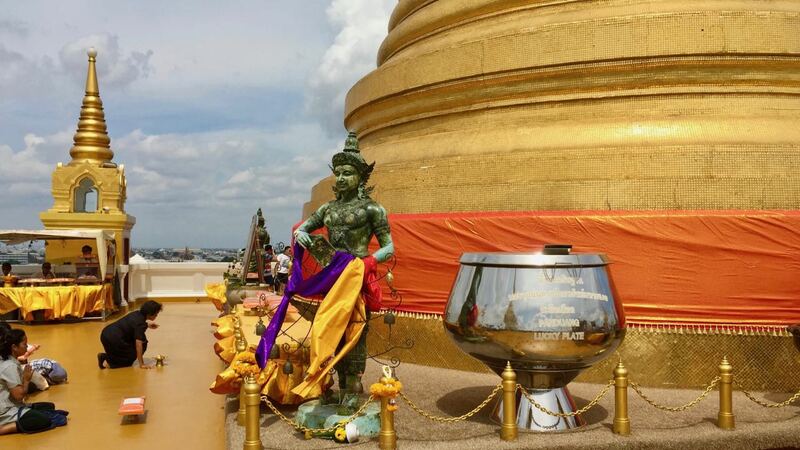 Perched at the top is a large shimmering gilded gold chedi that was constructed to mark the entrance to the city. Whilst under construction the hill collapsed as the soft marshy soil could not support the enormous weight. In the 1940’s the hill was finally reinforced with concrete to prevent further erosion and that is what you can see today. The Golden Mount used to be the highest point in Bangkok that was visible from across the city. It retained this title until the mid 20th century until the Dusit Thani Hotel in Silom became the tallest building in Bangkok. During the late 18th century Wat Saket was used as a crematorium. An estimated 60,000 victims of the plague epidemic that struck Bangkok were deposited and cremated here. The neighbourhood is still known as Phratu Phi that means ‘Ghost Gate’. The Golden Mount remains a sacred pilgrimage site that attracts many worshippers. There are approximately 300 shallow steps that slowly spiral both up and down the side of the hill. During the gradual ascent, you can admire the unfolding views. There are several shaded areas to stop and rest. 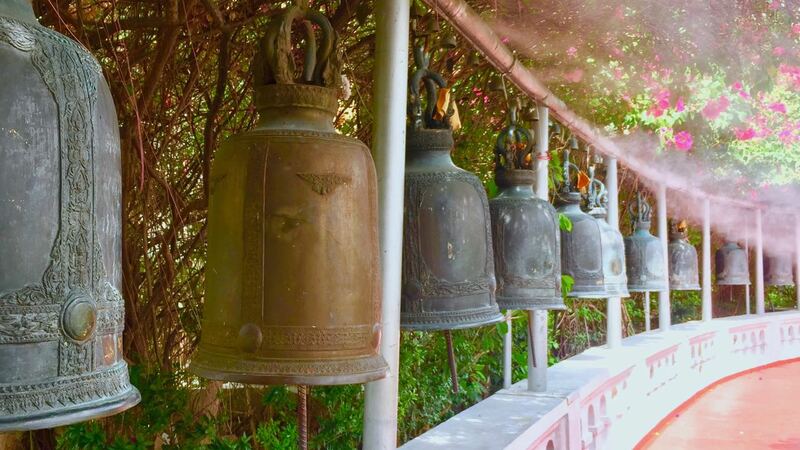 Here you can ring the prayer bells and gongs and wish for good luck. With the sound of running water and the chiming of the traditional Thai bells, the climb is very pleasant and relaxing. The main hall is rather non-descript. There are many Buddha images and at the centre, directly under the gold chedi above, there is a space that houses many Buddhist relics from India. 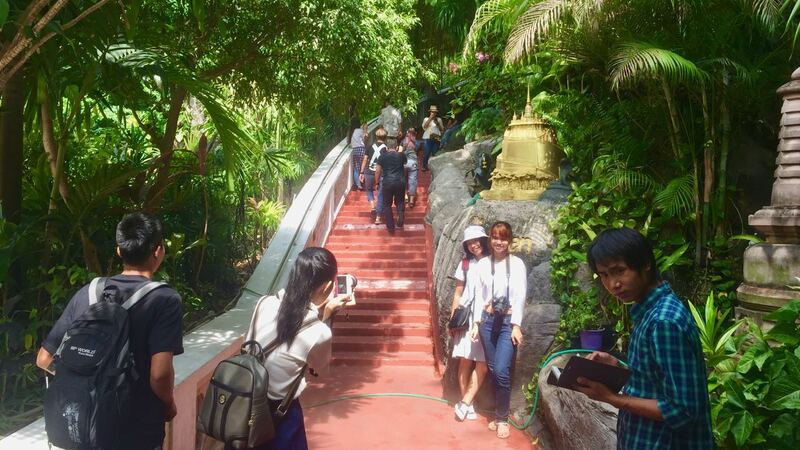 Climbing up the narrow stairway you will arrive at the rooftop terrace that is known as reaching heaven. Many locals pray and make offerings around the impressive large chedi that is covered in gold mosaic tiles. From this peaceful vantage point, you can relax and enjoy the fantastic panoramic views across Bangkok before descending back to earth.